This is a little quirky and I know its not everyones style. But I am all about quirky style (well OK not the Lady Gaga I-wear-meat-or-just-underwear-in-public-level of weird) but a little kookyness is good! Today while I was getting dressed I noticed I had a shirt in my wardrobe that no longer fit me and the print was a little OTT for a whole shirt . 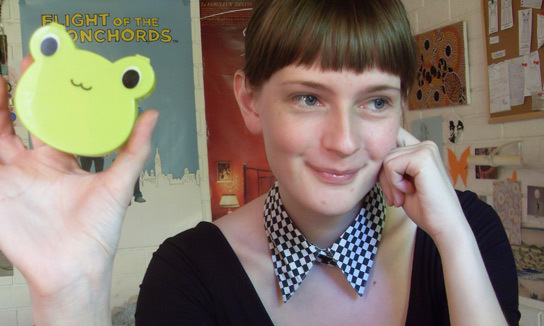 Perhaps its not a big revelation but I cut off the collar and now the collar is a frivolous fashion accessory that I love! It reminds me of those miu miu collars from a few years back…Wow I just discovered a tutorial here I am 3 years behind haha never mind. 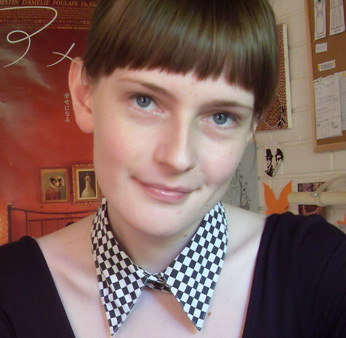 Also I remember coveting these collars in 2010 when one of my favorite fashion bloggers made and wore them! She is adorable. Look at how she styled the collar here I love her colourful retro style! 2. 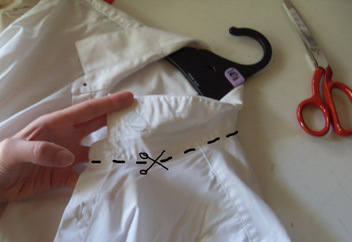 Cut just below the stitching line of the collar stand. The container I am holding is from Daiso store in Chatswood, Sydney, Australia (it came in a set with 2 other animal contaniers). It’s from a Japanese shop where everything instore is $2.80 an item. If you are a horder of have no storage space perhaps you should enter with cation. Such a great shop for cute/silly/kitchy items though :)! OK so another thing I am excited about. Today I bought a small cookbook holder that makes a fantastic stand for my Samsung Galaxy Tab. Those of you who have ipads or galaxy tabs you would know how expensive the proper stands are and this one does the job nicely for $4. 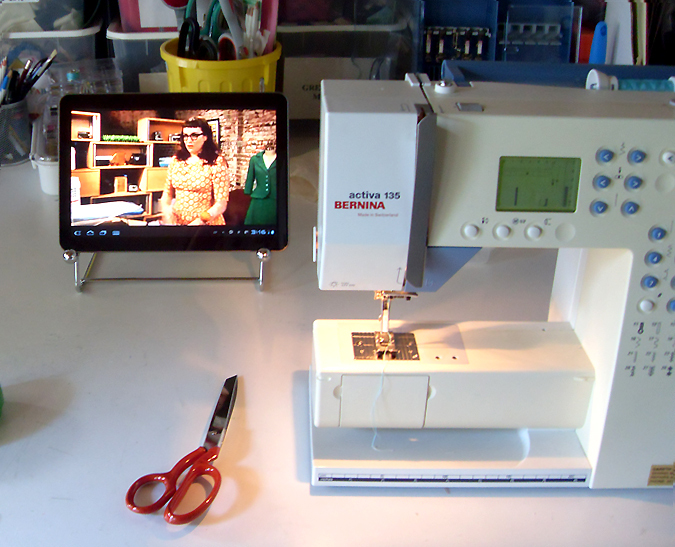 This is so excellent also because I don’t have room for a TV in my sewing room. Edit: I wrapped some cut pieces of rubber bands around the metal slats of the cookbook holder (where my tab rests on), that way it has a bit of traction and wont slide off. 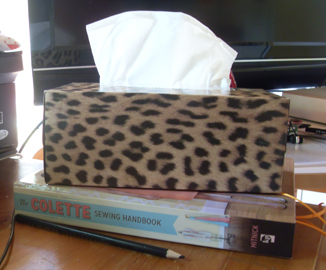 OK perhaps this is the most trivial thing ever but if you are an Aussie and you hate cheesy tissue box designs with pastel butterflies and that sort of thing: The Reject Shop has leopard-print tissue boxes at the moment for $1. I love leopard print so I was sold! Now If only my sewing room wasn’t so cluttered I could get in and do some actual sewing!